The winners from Y1-Y6 of June's Javelin Sporting Lunchtime Challenge were announced today (25.6.18) in whole school assembly! Well done to the Gold, Silver and bronze winners in each year group. Congratulations to both Bethany and Shivam who this morning in whole school assembly (25.6.18) were announced as Playground Guardians of the month. ​The Lunchtime Behaviour Team praised them for their willingness to help and support others with small disagreements on the yard and being excellent role models! PROUD! 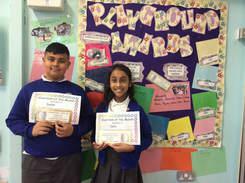 Congratulations to both Joseph and Alexandra who this morning in assembly (4.6.18) were announced as playground guardians of the month for May. Due to their willingness to help the midday team, play and invent games with younger pupils and for having an outstanding attitude to all playground school rules. Thanks to all of the children's ideas and feedback from our wonderful school council representatives. 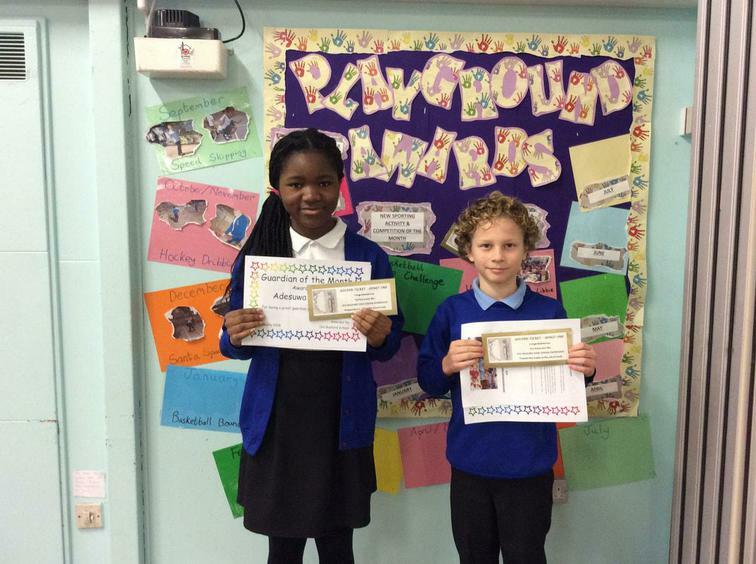 Congratulations to both Adesuwa and Will who were today (29.1.18) in whole school assembly awarded School Playground Guardians of the Month! Both have been incredibly helpful and used their initiative on our two school yards. ​They demonstrate examples of excellence for all children to aspire to be like and look up to. PROUD! Congratulations to both Sara and Dylan who this morning (18.12.17) were announced as playground Guardians of the month for December. ​The Lunchtime team said that they are both extremely helpful, go out of their way to make others feel included and are excellent at playing games with the younger children. PROUD! This lunchtime we held our first FINE DINING experience of the academic year. 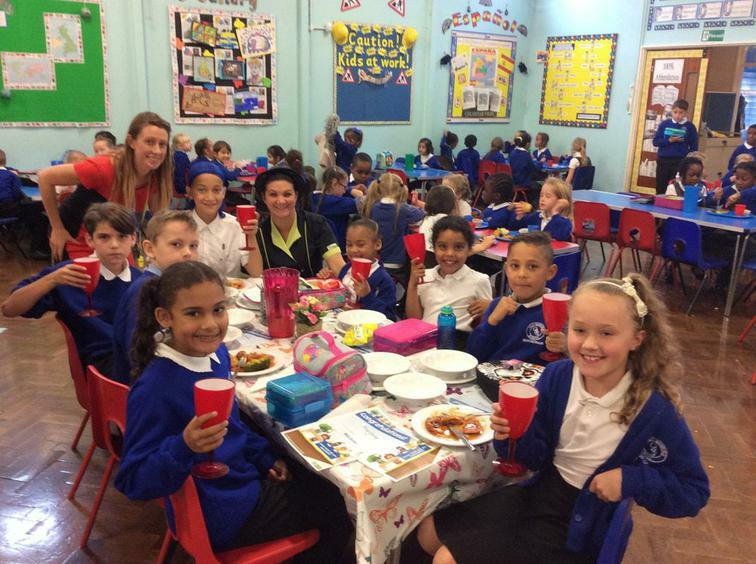 Mrs Shaw enjoyed having lunch alongside our golden ticket winners from September's Playground Awards Assembly. Thank you to Tanya and the kitchen team for providing the children with a VIP experience! 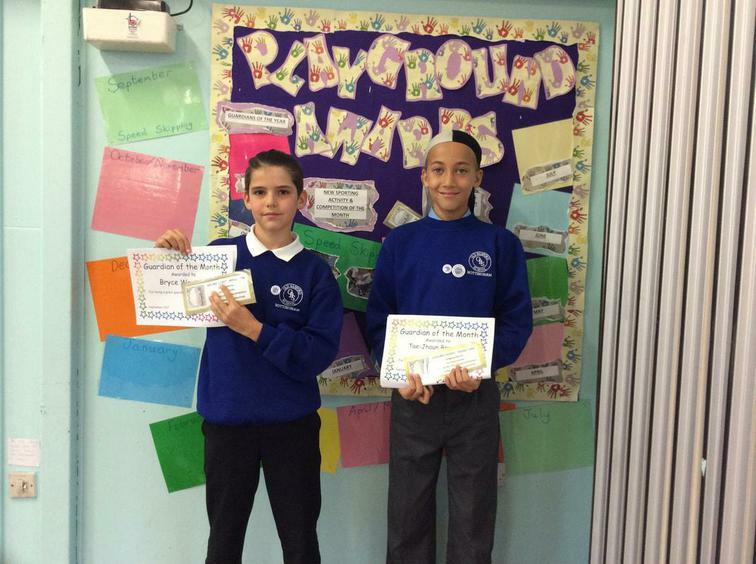 Playground Awards for September 2017 and our first Playground Guardians of the Year announced. Today (9.10.17) during whole school assembly we celebrated the achievements of children throughout our school on the playground. We announced our speediest skippers! Wow! Some of you are SOOOOO FAST! Eight children will be having a FINE DINING experience with Mrs Shaw this week after receiving one of our GOLDEN TICKETS for their excellent participation. ​The children were all eager and keen to give it a try! Look out for more pictures to follow soon. ​Playground Guardians of the month for September! 1) your ability to know what to do and when to do it, 2) for offering to be helpful and using your initiative, 3) for playing games with younger children, 4) for ensuring you have been actively promoting a happy and active school yard. ​We are very PROUD of you both!